How do I install TP-Link router to work with a Cable Modem? Note: This article is not relevant to you if you have any of the following conditions. 1．Turn off your router,modem and computer. 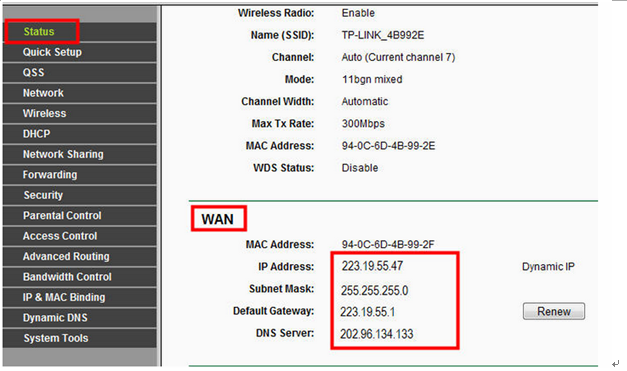 2．Connect your modem to the WAN port of the TP-Link router via an Ethernet cable;connect the main computer to TP-Link router’s LAN port via an Ethernet cable. 3．Power on your router first, then the modem and computer. Note: please make sure you are able to access internet with a direct connection from the main computer to your cable modem. If the direct connection does n’t work, please contact your Internet Service Provider. 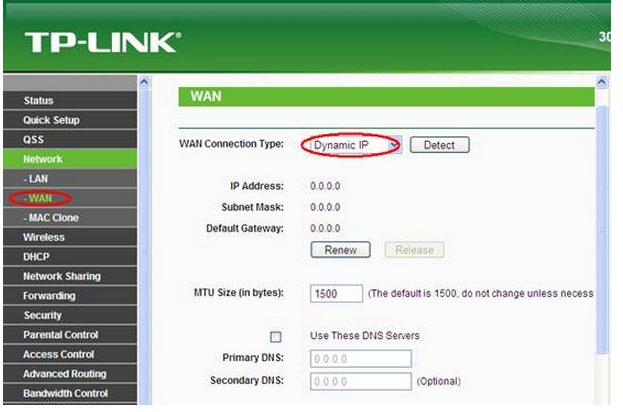 Select Dynamic IP as the WAN Connection Type on the right of the web page, shown as below. Then click Save button. Wait for a few minutes and check the WAN part on the Status page, if it shows any IP address (similar as below), that means the connection between the Router and the Modem is established. If there is no WAN IP address, please move to step 4. Click Network->MAC Clone, Click Clone MAC Address, then click Save. If there is still no wan IP address, please restart your cable modem, wait for about 10 seconds, and then restart your router. After the restarting process, you should get Wan IP address and Internet access. Note: Some cable modem has a back-up battery inside. To completely restart the cable modem, please take the battery out, and then unplug the power supply.